Russia currently does not maintain any relationship with the G7, Russian President Vladimir Putin said. "We have no relations with the G7, what relations could there be?" 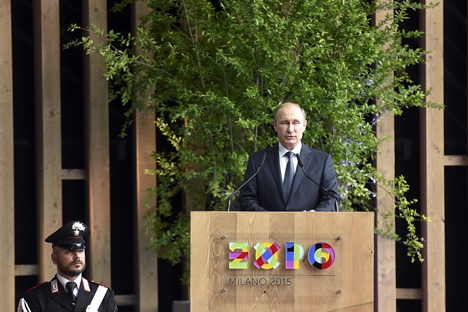 Putin told journalists following negotiations with Italian Prime Minister Matteo Renzi on June 10. At the same time, "if our partners want it, we will be developing active relations with any of the G7 countries on a bilateral basis," he added. When Russia was part of the G8, it was actively involved in its work, in particular, in preparing final documents, Putin said. "It seemed to me that this made some sense, because we at least presented some alternative standpoint. Our partners decided that they don't need this alternative standpoint. This is their decision. After all, this is not an organization but something like a club," Putin said. At the same time, Putin said Russia wishes the G7 good luck. "I believe any contacts and any discussion should promote international relations," he said. Italian Prime Minister Matteo Renzi said Europe needs Russia to tackle geopolitical problems. "The international agenda is very complicated now. Russia is one of the principal participants in the process, along with Europe and America. We should give a response to international challenges, which often unite us - I am talking primarily about international terrorism," he said. He mentioned Islamic State, al-Qaeda, and the Taliban as organizations posing an international terrorist threat. "The intensification of fanaticism, terrorism, and religious extremism leading to the deaths of innocent people is a common theme. These events make it essential for key world powers - among them the Russian Federation, which has always been a great power and remains to be such - to have key areas of cooperation. I am sure such dialogue will be continued," Renzi said. Vladimir Putin also said he expects that sanctions that are restricting relations between countries will be left behind with time. "I expect that, sooner or later, we will drop the restrictions that we are dealing with today," Putin said. The sanctions have also had a certain impact on Russian-Italian cooperation in the military-technological field, he said. "There is not that great [a level of] cooperation there, to be frank, and it is not of some fundamental significance for Russia's defense capability. But the cancellation of some joint actions and contracts planned earlier has left Italian companies short of one billion euros. They could've received it, engaged their enterprises, and created jobs. This hasn't happened because of the sanctions," Putin said. Russia is pursuing an import substitution program now, "and there are actually some benefits for our industry and high technology from this," he said. "But, on the whole, this surely causes damage to our interaction," Putin added. The Russian leader said the Italian prime minister and he had discussed the sanctions, but they did it "in kind of earthly terms - not in terms of their cancellation or reduction, but we talked about how these sanctions obstruct our relations." Russia and Italy are pursuing several joint projects, including those related to infrastructure, and "it is absolutely obvious that Italian companies that competed for these contracts and won tenders are interested in their implementation, but they've been suspended and cannot be implemented because of the sanctions against some of our financial institutions," he said. "It's just necessary to look for a solution - you either lift the sanctions or offer some other instruments, surely, if you want to support your companies. We'll find partners, but it seems to me that we shouldn't discard well-established instruments and mutually beneficial contracts," Putin said.